This post has 1,558 views. I finally jumped on the media streaming device bandwagon and bought myself a Google Chromecast. I wanted to put my TV to better use since I don’t have cable/satellite, but I didn’t want to spend $50+ for a Roku or similar streamer, so I ended up buying a recertified Chromecast off of Groupon. It was a good deal after the $10 off $25 purchase discount. I finally got my Chromecast a couple days ago, and here are my quick impressions of the device. Getting into the media streamer game. 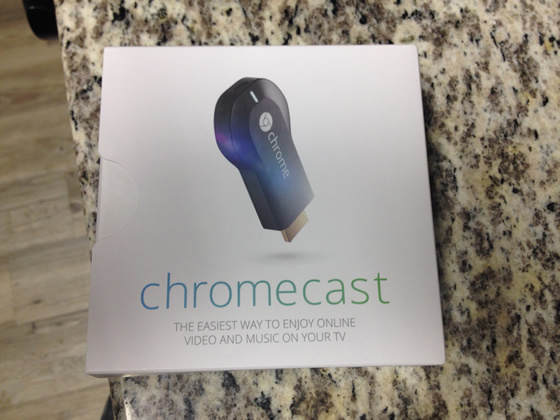 The Chromecast came in a small but nice-looking box. Inside, there is the Chromecast dongle itself, a micro-USB to USB cable, and a small power adapter. It’s definitely a small package. There isn’t really a manual in the box as all of the setup instruction is on the Chromecast website. The setup process is pretty simple. After the dongle is plugged into the HDMI port, it can be powered by either plugging the USB cable into the TV’s USB port or using the power adapter and plugging into a socket. Do note that the Chromecast doesn’t have an on/off switch, so it never turns off if plugged into the power outlet. 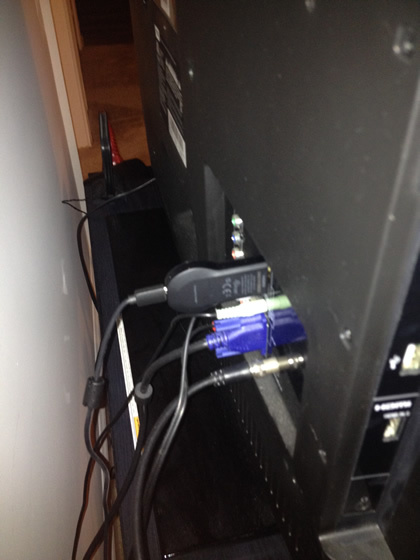 I plugged mine into my TV’s USB port, so it turns off when the TV is off. After that, I went to the Chromecast website to download and install the setup utility on my laptop. The utility locates the Chromecast, and sets the device up to connect to the appropriate Wi-fi network and also download any appropriate software updates. Once that’s done, I was ready to begin casting. The Chromecast plugged in and ready to go. Unlike other media streamers, the Chromecast doesn’t come with a remote, since the device is meant to be controlled using a computer, a tablet or a smartphone. I use my laptop to do the casting, since I usually use my laptop to watch media and I use the Chrome browser anyways. Since I already use Chrome, all I had to do was to install the Google Cast extension for Chrome. With the Google Cast extension, I can cast any Chrome tab to the Chromecast. My impressions of the tab casting is pretty good, especially for online video players. The extension is smart enough that you can put a video to full screen on the TV but the video will not cover the laptop screen, and the sound from the video tab being cast will only come from the TV/Chromecast. 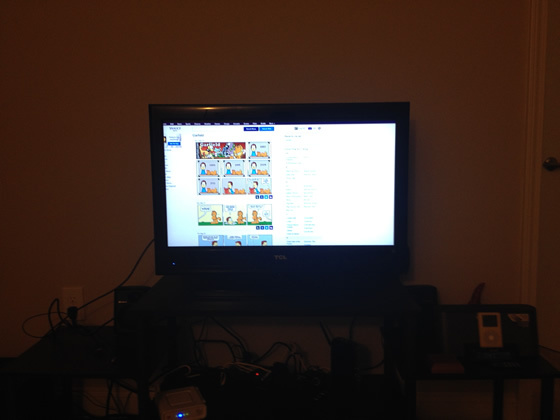 In addition to just casting online streaming videos, Chrome also plays certain types of media files such as MP4 videos, and that’s one way to play content in the hard drive on the TV without physically connecting the laptop to the TV. In addition to just casting individual Chrome tabs, the Google Cast extension can also cast the entire desktop, but this feature is experimental. From experience, that feature works okay as long as the laptop is not connected to another display. This feature tries to cast the entire desktop, so it looks pretty messed up when it tries to cast both displays onto the one TV screen. I even tried playing music and video while the desktop was being cast, and the Chromecast showed everything on the TV and played the audio, albeit the video does have a some lag. For an experimental feature, this isn’t bad, and hopefully Google will make this feature more refined and stable. Being able to choose which display to cast would be nice. As a first impression, the Chromecast worked as expected, and now it’s more convenient for me to watch something on my TV since I don’t have to connect the cables anymore. I also liked Chromecast’s small package and ease of setup. I’ll probably stick with Youtube and other free online content for now, but now that I have a media streamer I can think about getting a Netflix account… if I had that much time on my hands haha. I also have a smartphone, so I’ll try to do some casting with that as well.